Has Donald Trump saved Twitter? The past couple of years have not gone well for Twitter. User numbers have stalled, attempts to monetise the platform have come to naught and no potential suitors for the company have emerged, despite plenty of rumours. Yet, Twitter is probably now the most important (social) media company in the world. It was central to Donald Trump building his fanbase and allowed him to communicate directly with voters during the election, ignoring the media and their pesky fact checking. Essentially it delivered what the internet first promised – a way of interacting with the public without going through middle men, and was, in a large part, directly responsible for Trump’s election as President. And Trump’s use of Twitter has, if anything, intensified since the election. He’s used it to challenge the intelligence services’ claims that the Russians hacked Democratic Party emails, and to take potshots at businesses that he claims are moving jobs and production outside the US. The result? Companies such as Ford and Carrier have backed down on overseas investments and the share prices of Lockheed-Martin, Toyota and GM amongst others fell after Trump tweets criticising them. PR and analyst relations professionals for blue chip companies must be spending their time glued to Trump’s Twitter feed, hoping and praying that he doesn’t single them out for punishment, like hapless flunkeys at the court of a particularly unpleasant medieval monarch. If you needed proof of the power of Twitter, Trump provides it. And ironically, given the left-leaning sensibilities of Silicon Valley, he could well have saved the social network, or at least bought it some breathing space. The number of tweets sent in the US between August and November 2016 was over 1 billion (not all from Trump), with 75 million on election day and its aftermath. While it hasn’t helped the long-term share price, it undoubtedly aids efforts to find a buyer for the service. The question is whether this will be another tech company (Google is a logical fit) or whether another would-be politico will see the opportunity to build their profile à la Trump and invest. Whatever the outcome, expect more incendiary tweets in the future, with policy being set and communicated in 140 characters…………. For anyone looking for inspiration for their PR and marketing strategy it makes sense to look at what bigger players are doing. Obviously slavishly copying what they do won’t work, but there are always lessons to be learnt that can benefit your brand, whatever size it is. So looking at Apple’s strategy over the last few years is a good place to start. It may be difficult for many people to grasp, but 20 years ago the company was in a mess, hanging on for its very survival. Founder Steve Jobs re-entered the picture, pushing through innovative new products beginning with the iPod, and then moving onto the iPhone and iPad. The result? Apple became the biggest company in the world by market capitalisation, selling millions of premium products and building a reputation as the maker of must have gadgets for huge numbers of people. Keep it simple. Don’t use jargon in press releases, and ensure that your language is straightforward and easy to read. Value reporters’ time. Apple doesn’t send out many press releases (leading to complaints of secrecy). Contacting reporters sparingly does mean they’ll pay attention when you have important news – though this is easier for the likes of Apple to do compared to a startup that needs the oxygen of publicity on a more constant basis. Be hands on. Ahead of any interview Apple organised a hands-on product briefing to explain how it worked, the benefits and features. This is a great way to keep control of the conversation – again, it works better for a big player that has something reporters want than a smaller business struggling to attract their attention. Stay focused. Keep true to your mission (in the case of Apple providing products that allow customers to unleash their creativity). Don’t comment on news or trends that don’t support this as it wastes time and dilutes your message. Prioritise media influencers. Focus on the press and influencers that will shape the debate and use your time to build strong relationships with them, as opposed to taking a scattergun approach that targets hundreds of people. This is a really important lesson for businesses – it isn’t just about the amount of coverage you get, but also where it is – get into the right publications read by your target audience and your brand will get noticed. What’s also interesting is that Apple’s PR and social media strategy seems to be changing. Ahead of the iPhone 7 launch it created its first centralised Twitter account and more information leaked out about the details of the phone. Before this, CEO Tim Cook carried out press interviews after the billionth iPhone was sold earlier in the year. The change in strategy to be more proactive is partly a response to slowing iPhone sales, and perhaps also the well-publicised EU demand that it pays €13 billion in back tax to Ireland. Getting messages out early also allows Apple to monitor feedback and tweak what it is doing to ensure that the final launch goes smoothly and any questions are successfully answered. Whatever it may be, all companies should take a look at Apple’s PR strategy and see how they can apply the lessons to their own communications. Where does free speech end? The cover story in this week’s Economist warns against the growing dangers posed to free speech, by a combination of repressive governments, physical attacks on individuals, and the spread of the idea that people have a right not to be offended. The crux of the article is that the most worrying danger is actually the third one – by not listening to, and debating against, ideas that we find wrong we are actually limiting free speech. It is much better to dismantle an argument and point out its flaws by arguing against its proponents rather than banning the discussion of a subject or point of view, not matter how distasteful we find it. Of course, there are exceptions, as The Economist points out – incitement to violence, for example. Shortly after reading this I saw that BuzzFeed has pulled out of an advertising deal with the US Republican Party, now that Donald Trump has essentially won the party’s nomination. It has turned down an alleged $1.3m of income as it fundamentally disagrees with his position and policies. While this isn’t a curb on free speech as such – there are plenty of other places Trump can advertise, and I’m not sure how many of BuzzFeed’s demographic would vote for him anyway, it does illustrate another trend that I’ve noticed over the past few years. In the UK we’ve gone from a media landscape dominated by four TV channels (and I remember Channel 4 launching), and a set number of newspapers to a multiverse of places to get hold of our news and information. In many ways this personalisation is great – we’re served up stories, or visit sites/TV channels based on our preferences, meaning we get immediate access to what we are interested in. But on the other hand the shared experience has disappeared – the chances of watching the same TV programme or reading the same article are much fewer. Many people have given up linear TV altogether in favour of box sets or internet-based services such as Netflix or Amazon Prime, some of which auto suggest what you’d like to watch next, based on your previous viewing. At the same time local newspapers have been decimated by the internet, meaning that even many free sheets are no longer delivered, with the exception of titles such as Metro. So, it is quite possible that people can inadvertently edit out news that is outside their range of sources. To me, this is as much a threat to civil society as curbs on free speech. After all, you can’t complain against something you don’t even know is happening. So, what can be done about it? We obviously can’t/shouldn’t go back to the limited choice that we had before, particularly as much 1980s television was dire. What we should be looking at is ensuring that the places we are going for our news and information are open, level playing fields that reflect and provide us with a range of views. This is relatively simple for publically accountable sites such as the BBC, but much more complex for those like Facebook and Twitter which rely on user generated content. Facebook recently had to explain itself to US senators after allegations of anti-right wing basis in its Trending Topics section. The worrying thing is that while many people assume articles are picked by algorithms (which is potentially scary enough), there is major input from human reviewers, leading to the possibility of conscious or unconscious bias creeping in. Is there space for Google Spaces? Today our internet use is dominated by just a few tech giants – Google, Amazon, Facebook and Apple (GAFA) in the UK and US, with the likes of Baidu, Tencent and Alibaba leading the way in China. What is particularly interesting is that generally each of these is good at one thing, or group of things. We turn to Google for search and email, Amazon for ecommerce, Facebook for social and Apple for mobile apps. There is obviously some competition – Google’s Android versus Apple iOS for example, but in general each giant has stuck to its knitting. That’s not for want of trying – Google has tried to get into social media several times with projects such as Wave, Buzz and Google+, while Apple tried to launch Ping, a music-focused network. All failed, although Google+ limps on as everyone with a Google account automatically has a logon. It isn’t all Google’s fault – the most successful social media networks tend to start small and grow from there, such as Facebook, Twitter, Instagram and WhatsApp. Users are attracted by the features, rather than the brand name, and then it grows exponentially through the network effect – essentially the more people who join, the more value everyone involved gains from being part of it. Social media starts at the grassroots, and that’s one of the reasons that people join particular networks. Mark Zuckerberg at Facebook understands this, hence splashing out on Instagram and WhatsApp rather than trying to develop clones of them from scratch. This neatly neutralises the competition while keeping users within your orbit when it comes to the time they spend online. So that’s why Google’s latest attempt at a social media network, Spaces, looks like it is unlikely to take off in a big way. Described as a cross between WhatsApp and Slack, it allows users to have conversations and share information around specific topics with groups of people, avoiding, Google says, the need to hop between apps or cut and paste links. The trouble is it means installing/learning another app, and as far as I can see there’s no compelling reason for this to make it to the mainstream in its current form. Sure, people will use it to share information, such as when planning a holiday or big event, but it is hardly a threat to WhatsApp or Slack at present. What would be more interesting is if Google used it as a basis for more complex, artificial intelligence driven services, such as bots that could be sent off to gain information. So, keeping with the holiday idea, you agree where you’d like to go and use Google to collect and sift relevant information, such as accommodation, weather and flight times, and present it in a single place. Given how long it can take to find all of this normally, that would attract users – and of course provide Google with much deeper data on what users are looking for, enabling them to sell more targeted advertising and hence boost overall revenues. It is early days for Spaces, but it looks like it needs a bit more of a wow factor if people are going to use it seriously. Google has been burned before on social projects that have been well designed, but fallen short when it comes to getting consumers excited – so time will tell if Spaces joins the likes of Buzz and Wave in the failure column or carves out a loyal user base. However at the moment Spaces risks being seen as neat, but non-essential – hardly the best way to attract us from existing applications. The press and Twittersphere have been in tumult this week concerning the unexpected departure of five key senior managers from the microblogging site. Shares fell by nearly 5% as investors worried about the company’s strategy for growth, while CEO Jack Dorsey was forced to take to the social network to reassure the world that the departures wouldn’t overly impact Twitter. Given that user figures stubbornly fail to increase beyond 300 million, and that the share price has dropped by 67% since last April, the executive exodus is seen as symptomatic of wider issues – particularly an inability to make money on the scale of rival Facebook. Bold ideas trumpeted to revive the network include extending the lengths of tweets from 140 to 10,000 characters, but it doesn’t seem clear how this will increase revenues. In a month that saw social media pioneer Friends Reunited finally close, is it possible that Twitter will eventually go the same way? Twitter does have a number of problems – many of which revolve around the original structure of 140 character messages, all displayed in real-time. It is easy to meet messages of interest given the sheer volume of content on the site and the user experience is not as immediately friendly as the likes of Facebook (which has also done a much better job of collecting and monetising data on its users and their habits.) When I was in Singapore last year I was told that no-one really used Twitter as they didn’t see the point, and it is true that in the UK and US much of network’s high profile comes from its use by commentators, journalists, experts, and Donald Trump. So, is Twitter doomed, and if so what will take its place? First off, it does seem strange suggesting that a business with 300 million users is on its last legs, but we live in a world governed by network effect and the likes of Facebook have much larger user bases. And of course, none of the 300m is paying to use the service. Twitter seems like a network that doesn’t have a clear purpose – people tend to use Facebook for personal social contact, and LinkedIn for business. Both of these have bulked up their offerings, with Facebook pitching itself as a channel for customer service, with Facebook Business on Messenger, and LinkedIn’s ability to write and share blog style content providing a channel for business insight. Essentially Twitter is being squeezed, and for many people has become just a signposting tool, pointing to content hosted elsewhere. I tweet all my blogs, and it provides a steady stream of traffic to my posts – although not as many as LinkedIn. Despite its relatively friendly and sensible design Google +, its own social network, has failed to gain any traction, and merging the two will bring the best of both worlds together. There are allegedly 500m Google + users, mainly because registering for other services automatically adds you to the network, providing a ready market for Twitter – and that’s before you start looking at the hundreds of millions that use Google search or YouTube. Other tech companies, such as Facebook, Amazon and Chinese rivals Baidu and Tencent are offering more and more services. Google therefore risks being left behind in the long term as consumers choose to spend more of their online time with fewer providers. So there is logic behind a deal – though I’m not sure what the new entity would be called. Gitter or Twittle anyone? Having worked in PR for 20 plus years I’ve seen the power that well-written, relevant and targeted content can deliver for companies. Whether it is a pitch that leads to an article read by the target buyer at a B2B company that causes them to make contact with a client, or a press release that boosts name recognition with a potential investor or acquirer, public relations has always had the ability to deliver the right messages to the right audience at the right time. And the advent of blogs and social media has simply increased the importance of good content – helping engage with potential customers and position an organisation as an industry expert even before the target actively starts research. Additionally, with more and more of the buying journey taking place online, the SEO benefits of relevant, topical content cannot be underestimated when customers typically start the research process via Google or industry websites. All of this is pretty well-known, but what I’ve seen over the last year or so is the use of content to reinforce the personal brand of business people. I don’t necessarily mean CEOs or entrepreneurs, who have always relied on the oxygen of publicity to build their reputations, but middle ranking managers on their way up. Rather than (or perhaps as well as) networking internally and bending the ear of their bosses with their knowledge and industry insight, they are now able to share through Twitter, and most particularly LinkedIn’s inbuilt blogging feature. This provides a platform which hosts individual’s content, as well as sharing it with their network, and further afield via LinkedIn Pulse. I’ve seen myself how incredibly powerful this is in keeping in touch with people you are connected to, and building your brand. It seems to me that writing content is now one of the key skills that any manager needs, alongside technical knowledge of their particular field, understanding of their role (whether it is sales, administration or marketing, for example), and the basic business/financial nous that means they can read a spreadsheet and grasp the intricacies of a forecast and profit and loss account. But making it easy to share content doesn’t necessarily make it easy to write good, well-thought out and grammatically correct pieces. The risk is that business people will jump on the content writing bandwagon and actually undermine their professional standing by penning incoherent, rambling or misspelled pieces. To avoid this, here are six key ways of guarding against looking stupid when writing on LinkedIn. While the success of your content is up to you and your ideas, focusing on these ideas should help you remain professional and demonstrate leadership. People don’t want to read a corporate press release that simply been pasted into a LinkedIn blog post. By all means share interesting news from your company as an update on LinkedIn or Twitter, but a blog post should be personal and relate to your experiences and views on a subject. Obviously you need to balance your own thoughts and the views of your employer, but if necessary insert a statement that this a personal blog, not necessarily reflecting the position of the company you work for. However don’t be too personal – sharing too much detail about your home life or what you did at the weekend can alienate contacts, particularly if they only know you in a business environment. So much content starts well and then rambles off into a dead end or randomly changes direction part way through. Sit down and write a skeleton of what you are going to say, with a beginning, a middle, and an end. What points are you going to cover? What is your conclusion? What are the alternatives? I find it helps to do this with pen and paper but the important thing is to start by planning, not start and hope for the best. Remember that you’re not writing War and Peace but creating something that people can read online in a few minutes. So keep it to a manageable length (800-1000 words), and if necessary split your piece in two to avoid your ideas being lost. Good content teaches someone something or moves the debate on, and remember that it represents you and your personal brand. Therefore don’t simply rip off other people’s ideas without giving them credit and a link to their work. Share your content with them and they may well share it in turn with their networks, boosting your reach. We all think we’re wonderful at spelling, but everyone has weak points, so make sure you spell check everything that you’ve written and I advise printing it out to proof it properly. It is best to write a piece, and then come back and proof it later on, giving you the advantage of fresh eyes. Always pass the article to someone else to review as well – whether they are part of your target audience or not, they can pick up mistakes that you’ve missed or areas where things need to be made clearer. Obviously LinkedIn automatically shares content you’ve created with your own network, but that should only be part of your outreach. Use Twitter to spread the word further and post the article on any relevant LinkedIn groups that you are a member of. You can even email it contacts if you think it would be of interest and help deepen engagement – but don’t just blast it out to your entire contact book. A single post is unlikely to make you a thought leader so look to create content regularly. It doesn’t matter if it is every week or every month, but set yourself a schedule and try and post at a regular time so that people eventually come to expect (and hopefully look for) your articles. Little and often beats writing a huge first post and then losing interest and going off to do something else. Content writing is becoming a key business skill – but bear in mind that the world is full of bad or simply unread content. So take the time to think it through first before hitting the keyboard if you want to build your reputation as a thought leader. Will Facebook take over the world? Last week Facebook announced that on Monday 24th August 1 billion people logged into the social network. That’s 15% (almost one in seven) of the world’s population using Facebook in a 24 hour period. And given that over half of the globe still isn’t online, the percentage of actual versus potential users is actually much higher – closer to 33% of the 3.195 billion internet users. 1.Is it a good thing? It is difficult to find a parallel in history for a single entity being used by so many people across the world. There have been monopolies in the past of course, particularly in telecoms before deregulation, but these operated at a country level, and you didn’t have a choice. You wanted to make a phone call and you had to use BT or AT&T. When it comes to control over how people communicate the only example that comes to mind is organised religion, such as the pre-Reformation Catholic Church where all of Europe was subservient to the Pope. As yet, Mark Zuckerberg hasn’t branded any Twitter users as heretics, for which we should obviously be grateful. Critics will argue that having one company central to how we communicate with friends and family, find our news and even shop is a bad thing. On the other hand, Facebook fans will point out that you have a choice – other social networks are available and the past is littered with previously successful companies (such as MySpace) that failed to evolve. This does ignore the impact of the network effect – as more and more people are on Facebook, it becomes increasingly necessary to be on there if you don’t want to miss out. Technically it is very easy for anyone to create a new social network, what is difficult is enticing enough people to join to make it necessary for their friends to also jump aboard. What is definitely true is that Facebook, like other international online giants, does need to scrutiny that matches its power and reach. I’m not talking about regulation per se, but any organisation that has Facebook’s combination of personal demographic data and ability to analyse it on a grand scale has to meet the highest standards of behaviour. 2.What about the other 85%? The obvious point that many people have made is that if 1 billion people were on Facebook on a single day, the remainder of the world (85% in fact), were doing something different. As we’ve seen, Facebook has captured a large percentage of the online population, which is why the company’s efforts are being put into increasing the number of people with access to the internet in some form. Its main vehicle for getting people online is Internet.org, which provides free basic internet services in areas where it is either non-existent or unaffordable. Some of the ways Internet.org is looking to extend coverage include high altitude planes beaming a signal to a particular area, lasers and satellite technologies. However Internet.org has attracted criticism for only providing access to a walled garden of services, including (surprise surprise) Facebook itself. Clearly if Facebook is to grow it is easier to expand the pie of internet users and reach the currently unconnected, rather than target the refuseniks in countries where it already enjoys high penetration rates. Expect more efforts to extend internet access – probably not just within developing countries but also within ‘notspots’ inside existing markets, thereby encouraging people to use the service even more. Facebook has already overcome two major hurdles that have defeated its rivals. It has successfully transitioned to a mobile-first world (87% of access is from mobile devices), and is generating growing profits. As well as extending its reach to new victims (sorry, consumers), it also needs to increase engagement – i.e. ensure people still log on and use the service, and do it more often and for longer. The big bet that Zuckerberg has made here is on virtual reality, with the $2 billion purchase of Oculus VR expected to spawn headsets that deepen the experience of using Facebook and interacting with your friends. This, for me, is where things start to get more than a little creepy – if people are addicted to Facebook now, just imagine the time they’ll spend online if they can essentially experience reality without leaving their screen. Plus, with the current size and design of headsets, everyone will look like they are part of Daft Punk. Football crazy? Can clubs control the media? The new football season is already nearly a month old, and while action on the pitch is taking centre stage, how fans get information about their team is also becoming a hot topic for debate. Several clubs, such as Swindon and Newcastle, have banned certain newspapers from attending their press conferences or talking to their managers and players. The reason? They prefer to communicate direct with fans through club websites, newsfeeds, social media, apps or even in-house TV channels. Scottish club Rangers has even banned particular journalists due to not liking the articles they’ve written about the club’s governance or finances. In a way this approach simply fits with the ability of the internet to remove middlemen (in this case the media) and to connect brands directly with their audiences. However it also sets a dangerous precedent – with coverage reduced to happy soundbites stage managed by the club’s PR team. The decline of newspaper and magazine staff numbers has tipped the balance in favour of big brands, with many journalists now using their skills to publicise companies and PR agencies. Football teams are not the only brands aiming to do this, using the distribution mechanisms of the internet and social media to get their message out unfettered by the critical filter of the press. As a PR person I can see the initial attraction in this – after all, what marketing manager doesn’t want guaranteed 100% positive coverage? But it isn’t sustainable. One of the reasons for the rise of PR was that an independent article in a newspaper or an interview on the radio was more believable, and therefore worth more than an advert. While the internet has blurred the lines, I’m convinced people still react best to coverage that delves deeper than a press officer’s prepared statement. Football is the perfect case in point – fans may love their club, but be intensely suspicious of the owners, board, manager or particular players. Take the frequent demonstrations at matches and the vitriol directed at players on social media. Therefore simply providing bland statements of how the new centre forward is looking forward to the season ahead and how wonderful the training facilities are, is not going to keep true fans interested or happy. At the same time social media, while providing a channel for brands, also actively undermines them by making it easy and fast to share unofficial information. This could come from anywhere – a disaffected (or unthinking) player, a taxi driver that overheard a conversation or a barman that saw that same new centre forward slumped over his pint the night before his debut. What brands (of all sizes) need to realise is that you need three different types of content (paid, earned and owned) to build your profile. There is paid media, essentially advertising and sponsorship, where it is normally clear that money has changed hands. Earned content is when a third party (which could be a publication or simply a fan on social media) shares or publicises your messages. Finally, owned media are the channels you control – from in-house TV channels to websites and Twitter feeds. Successful brands combine all three of these in a cohesive way that builds engagement. Fans will want to the chance to interact directly with you and get information straight from the horse’s mouth, but at the same time they want independent verification through trusted third parties such as the press and the backing of their peers through social networks. And these same social networks provide the platform for independent fans and commentators to create and share their own content, outside the club’s control. Therefore the football clubs that have succumbed to the beguiling fantasy of controlling the news should take a step back and look at organisations and countries such as Soviet Russia that have relied on propaganda. Citizens stop believing in the news they read and before too long even the most rigid states begin to show cracks and eventually collapse. Most people know that the funding for the prototype of the internet (Arpanet) came from an agency within the US Department of Defense, and that one of the reasons for the decentralised nature of the network was to make it more robust in case of physical attack during wartime. Therefore it is ironic that the underlying internet infrastructure is used as a platform for new kinds of attack, from cyber warfare by individual states and as a way of disseminating propaganda by terrorist organisations such as IS. Of course, governments and terrorists have always aimed to use communication channels to get their messages across. Hence censorship in times of war, and even reporting restrictions during peacetime – I remember the ban on members of Sinn Fein (and other Irish republican and loyalist groups) from speaking on TV in the 1980s and 1990s. The internet, and more particularly social media, has opened up completely new ways of reaching audiences, and groups such as IS have been particularly strong at using these sort of channels. One study claimed that IS and its sympathisers controlled 90,000 Twitter accounts for example. Governments have tried to fight back, but the combination of the size and global spread of the internet and the difficulty of pinpointing specific individuals has made their job more difficult. The latest measures, recently announced by David Cameron, include ensuring that ISPs do more to remove extremist material and identify those that post it. However in a fast-moving world, the concern is that it is impossible for governments to move fast enough – as well as worries about the impact on free speech. Some people are therefore taking action independently. Hacktivist group Anonymous is targeting alleged IS supporters online, recently publishing a list of over 750 Twitter accounts that it claims are spreading IS propaganda. It is also trying to take down Facebook pages, blogs and websites used by supposed supporters of the group. To try and influence search engine results it is flooding some Twitter accounts with images of Japanese anime character ISIS-Chan, making it more difficult for those looking for information from IS to find it. I must admit that the attacks by Anonymous leave me in two minds. On one hand, anything that reduces the online footprint of a group that advocates cold-blooded killing of those that it disagrees with, can only be a good thing. But at the same time Anonymous is setting itself up as judge and jury – there is no right of appeal if someone innocent is targeted in error. It feels very much like the justice of the Wild West, perhaps because that is what many parts of the internet have become. 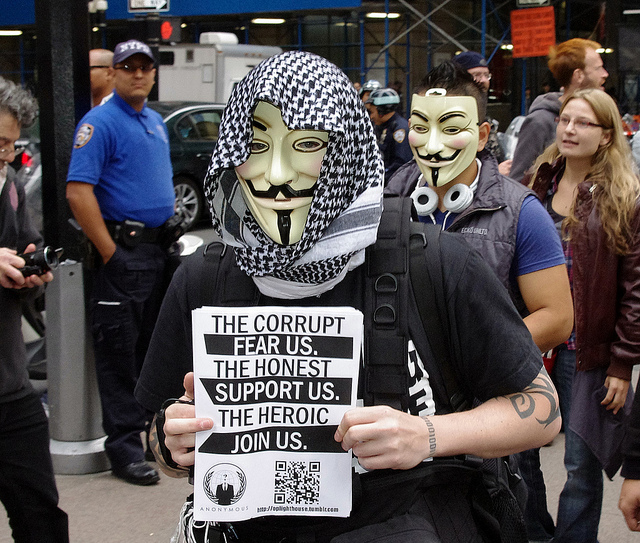 For example, other groups linked to Anonymous recently took down the website of the Royal Canadian Mounted Police, after one of its officers shot and killed a protester, an action that could have hampered the ability of the public to find out information or potentially report incidents. I’m sure Anonymous is confident in the information it is working with, and when it comes to IS its mission is laudable in many ways, and seems to be getting some results. But surely it is something that a combination of social networks and the authorities should be leading on? The real issue is that the majority of those with the technical skills to hack perceived wrongdoers don’t want to play by the rules – they’d much rather operate outside the law, rather than as part of it. The challenge for governments is therefore not only to persuade the online population of the dangers of IS, but to enlist the help of hackers to work with them more officially if they want to use their skills for good. That won’t be easy, but is vital if there is going to be a united front when it comes to the online War on Terror.